Ideal for cutting door and window openings, the WS 220 Wall Saw allows for deep cutting on horizontal and vertical surfaces. Our high-frequency wall saw operates on 1-phase and 3-phase power. It is a light weight, remote controlled wall saw assembly which means a reduction in operator fatigue and an increase in productivity. It is ideal for use indoors as well any area where carbon monoxide emissions are of concern. 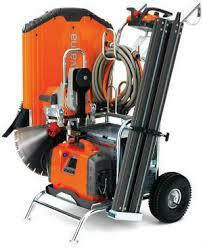 Check out the video below to see a wall saw in action. This is a different model to the one Sharp Concrete Cutters and Drillers Ltd has, but for all intents and purposes, the principles and applications are exactly the same. Please note that our safety standards are much higher than the lack of high visibility clothing demonstrated by the operator in this video. Check out our blog for shots of just one application. Our wallsawing service is ideal for cutting door and window openings. Sharp Concrete Cutters and Drillers uses the Husqvarna WS 220 Wall Saw allows for deep cutting on horizontal and vertical surfaces.